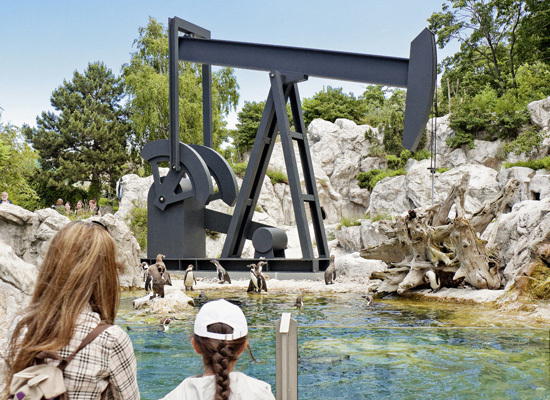 Schönbrunn Zoo in Vienna is host to a fascinating series of temporary art installations by Christoph Steinbrener and Rainer Dempf. 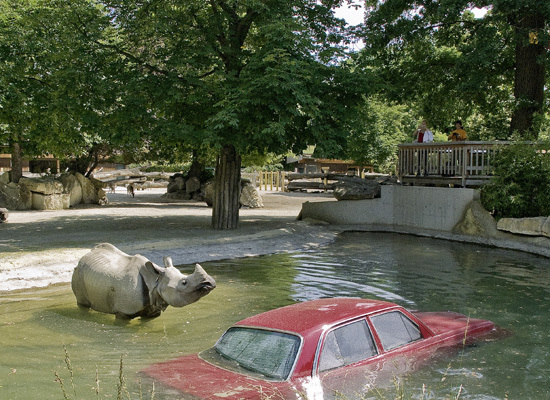 In one animal enclosure, the German duo have half-submerged a car in a watering hole used by the resident rhinos. In another enclosure, penguins frolic in the shadow of an oil pump, and in yet another, alligators must share their modest bayou with a bathtub and a monster truck tire. 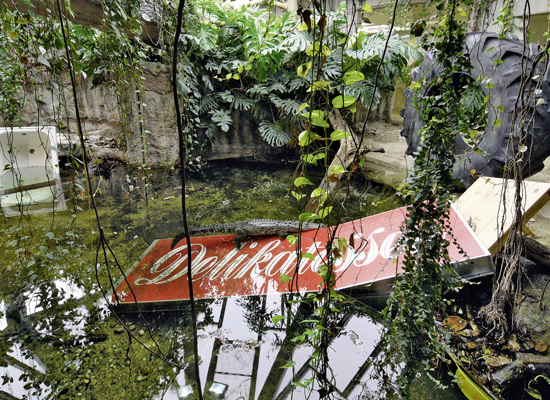 The installations will last until October 18, 2009. The fish image is particularly disturbing. I think the rhino looks unhappy. I understand the concept and I love this zoo very much. Not so keen on this installation though. I think you're just projecting. If it were unhappy, it's more likely because of having been forcibly taken from its natural habitat and imprisoned in a closet. But I could be wrong. You're not projecting. Rather, what's being projected is the rhino's emotional state, destabilized from years of forced captivity, being unable to graze in the open with its own kind and constantly having to deal with pesky humans. Same with the other installations. But wait! I could be wrong yet again. I'm the one who's actually projecting! After all, the installations are all about the viewers and little about the animals themselves. Disturbing in a good way. I kept expecting to see one where the animals are dead and/or disfigured -- the REPRESENTATIONS of the animals, of course. This is a fantastic installation. First off it engages a public in a place that isn't expected. It really makes people think about multiple topics - the morals of zoos as well as how we are treating the natural environment. Showing off animals in captivity is already an artificial construct and adding in elements that are seemingly out of place makes this strikingly obvious. 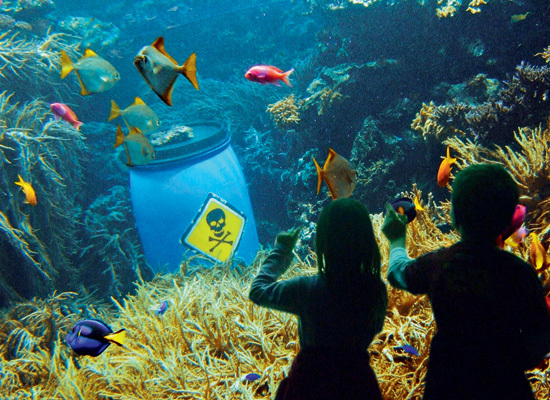 It also speaks to the utter waste dump we are treating our surroundings as. Good for them. I hope it upsets people and convinces even one person to change their habits. Total and utter rubbish. Continued exploitation of animals. Complete trash.